2018 in Review – Going Greener! My Bolt EV hit 20,000 miles of trouble-free driving. For me, 2018 was a busy year for auto writing, and also for climate action. In a normal year, I’d have 52 week-long test drives, a bunch of short tests at the annual Western Automotive Journalists event, and maybe catch a few more at some manufacturer’s event, too. This year, I tested only 28 cars for a week each instead of 52. I did have some quick sample drives at the WAJ event–mostly EVs. The biggest change has been my moving away from gasoline-only cars over the last couple of years, and stopping my testing of them entirely in September. 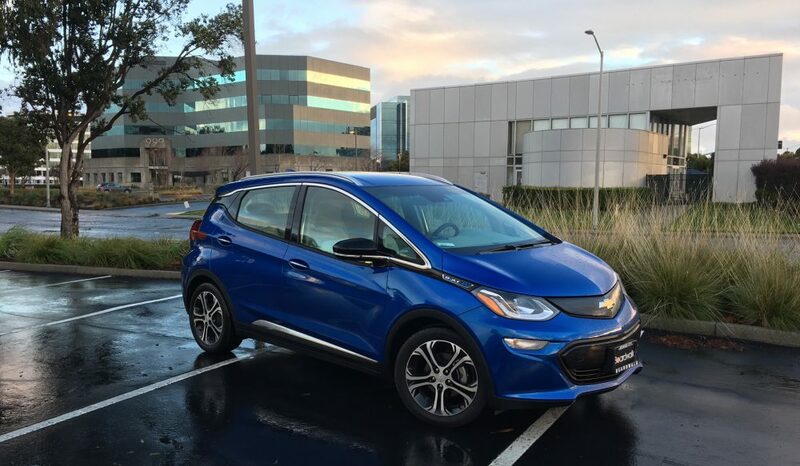 When I wasn’t testing a car, I was driving my own all-electric Chevrolet Bolt EV. My Bolt EV just turned over 20,000 miles, and with 10K/year on my lease, that’s perfect. Its two-year anniversary is January 8th. Maybe I’ll take it to the dealership for a check-up, since it’s never been back! Why the the complete end of ICE cars? That’s because on August 28-30, I attended Al Gore’s three-day Climate Reality Leadership Training in Los Angeles, where I became a Climate Reality Leader. As an electric car advocate and now, a climate activist, I have to put my efforts towards guiding people to what’s most important for the long-term health of the planet. And, I want to explore and provide guidance about all the great new EVs that are coming in the next few years. We know that petroleum-fueled cars will not disappear overnight, but there are lots of other fine journalists who can take care of reviewing them. Most of my auto writing, since it’s green cars only, is happily housed these days on www.cleanfleetreport.com, but I also run stories regularly in my original venue, the San Leandro Times (my first story appeared on February 8, 1992), as well as monthly in the Tri-City Voice out of Fremont, California. Steve Goes Green may have been home to fewer car reviews in 2018, but it has featured some new material on “going green” in other ways. Some stories came from attending talks at Acterra, a Palo Alto based organization that’s educating people and acting to fight climate change. See recent stories, such as Teaching Kids about Climate Change with Green Ninja and Ertharin Cousin – We Need a Food System for Human and Planetary Health. Of the 28 cars I tested this year, only seven had no electric motor, and they were all in the first 2/3 of the year. Naturally, with the limitation I’ve set, I can’t and won’t review everything, but that’s OK. Many of the best, most efficient gas-burners are featured on Clean Fleet Report, so it’s worth checking them out there. The most unusual EV this year was a 1967 MGB GT that a work colleague spent a year convering into a pure EV. The most exciting EV was the Jaguar i-Pace, which was an all-new crossover from a brand that’s looking toward the future. I expect lots of new models and electrified versions of current cars to appear in the next couple of years. In September, I planned and hosted the second National Drive Electric Week (NDEW) event at my company. I also attended the Acterra NDEW event and it was very busy! I let people drive my Bolt EV there, and I hope that experience led some of them to go out and get their own EVs. The NDEW event is an important way for people to learn about EVs directly from owners, not salespeople, and it’s fun for us EV owners to collaborate and share stories. In 2019, the first ever DEED (Drive Electric Earth Day) will take place, presented by the same folks who do the NDEW, and I plan to participate at work and elsewhere. In October, I attended one day of the three-day VERGE conference in Oakland, which is put on annually by GreenBiz as a coming together of green businesses. There are lots of them, and my busy day generated three stories (two published, one on deck). Here’s a general article on the day itself, and another on what GM is doing to purchase clean power for its plants. I look forward to attending events in 2019 and writing more of those kinds of articles. Clean Fleet Report gave me lots of quick news assignments over the year–26 were published–which brought my annual story total to around what I’m used to. These are quick takes based on press releases and other information. See my story on a new VW-based electric Meyers Manx. I also contributed stories on different subjects from personal journalist experiences, such as my visit to the Manheim Auto Auction. In November and December, I spoke with four solar companies, and a few weeks ago, signed up for solar panels on my roof! They’ll go on in April, and when they do, I’ll start charging my car at home. I’ll report more about my solar adventure right here. 2019 will have more EVs and more ways to go green! I plan to learn more about the way our food system affects the climate–from reading, studying, and interviewing folks, and also by slowly changing how I eat. Happy New Year, and thanks for reading! Hochschild was appointed by Governor Jerry Brown to the California Energy Commission in February 2013 in the environmental position. A longtime solar energy advocate, he worked with San Francisco Mayor Willie Brown to put solar panels on public buildings, and cofounded the Vote Solar Initiative, an organization advocating for local, state, and federal solar policies. He served as executive director of a national consortium of leading solar manufacturers and worked for five years at Solaria, a solar company in Silicon Valley. Hochschild’s goal now is to “bring light in dark times,” when the national government is going in the opposite direction from what we need for clean energy development. He believes that California can show the rest of the country—and the world—how it’s done. First, he showed how predictions of the growth of solar and wind were way too low. While the line on the graph for the prediction of solar implementation barely moves up, the actual installed solar generating capacity jets up at a steep angle. On a different graph, going down in exactly the opposite direction, is the line representing the value of the top four coal companies. They have lost 99 percent of their value in recent years. “It’s the beginning of the end of an era,” said Hochschild. Hochschild disparaged the long history of subsidies to the oil industry—which are still going strong with no end date. Meanwhile, the much smaller subsidies for solar have short time spans. California’s economy has grown, as has its population, but the state’s emissions have gone down, except in one area—transportation. But with the passage of SB 100 with Governor Brown’s signature in September, the state is on track to reach 100 percent clean energy by 2045. Hochschild explained that the 100 percent number represents “clean” energy, which is still being defined, but would not include nuclear. To get there, we will need to have diversity in the portfolio, including wind, solar, hydroelectric, geothermal, and others. “For years, skeptics have said that moving to clean sources of energy would ruin the economy, drive up unemployment, and raise energy rates, but it hasn’t,” he said. California actually leads the rest of the U.S. in renewables installed but has had 46 percent economic growth while over the same period the U.S. has seen 35 percent. Hochschild said that as a large market, California can affect manufacturers’ decisions on what to build. For example, our standards on the energy efficiency of TV sets saves consumers $1 billion a year, but the effect is magnified because companies choose to incorporate those standards into their products for everyone. One easy way to save energy is to switch to LED light bulbs from traditional incandescents, which are being phased out. Starting on January 1, 2018, stores in California were permitted to sell the incandescent bulbs they had in stock but couldn’t order more. As it is, customers are embracing LED bulbs, which cost a little more (prices have been dropping) but last 20 to 25 years and use 80 percent less energy than incandescent bulbs. Newer LED bulbs are available in a soft white and other shades, so they feel more familiar, emitting a warm glow. The compact fluorescent bulbs, which tended to have a harsh light quality, have faded away now that LEDs have taken over. Hochschild displayed images of large solar farms in the California desert that are producing vast amounts of electricity. The technology is improving so fast, he said, that they were able to incorporate improvements into the panels and the installation process mid-project. The major computer and software companies, such as Google and Facebook, are all signing on for 100 percent renewable energy. Hochschild showed an aerial view of Apple’s massive donut-shaped campus, covered with 17 MW of solar panels. The list goes on. California has the world’s second-largest lithium-ion battery plant (behind Tesla’s giant Gigafactory in Nevada). California leads the nation in energy from biomass, too. Offshore wind farms are developing—we saw the Block Island offshore wind farm in Rhode Island – the first one in the U.S. Offshore farms are easier to construct in the East, Hochschild explained, because the Atlantic shoreline is shallow, while the Pacific’s drops off. However, there is a new way of creating offshore wind energy in the Pacific Ocean by installing floating platforms for the windmills, tethered down to the sea floor. There are some significant benefits. “Offshore wind installations out at sea are not only invisible from land, but more important–the wind blows more of the time out there—60 percent versus 35 percent on land,” said Hochschild. “And because it blows at different times of the day from the times when the sun is shining, it can offset times when solar panels aren’t generating electricity,” he added. Offshore windmills are more expensive to install, but with greater capacity, they catch up by generating more energy. Regarding employment, there are 86,400 solar workers in California. That’s more than the workers in every other energy industry. And, it’s growing, as solar installations are increasing, reaching about a million in California. Hochschild believes that the best plan for clean energy would be to electrify all services and run them off a clean grid as we reduce use of natural gas. He talked about how much natural gas is used in homes today for furnaces, stoves, water heaters, and some dryers. But some new homes are being built without gas lines at all. “It saves $3,000 right away by not having to run the gas pipes,” he said. The good news continued. One hundred percent renewable energy will power the state’s high-speed rail system, when it’s built. California institutions have taken $6 trillion out of investments in fossil fuels. Hochschild compared the fossil fuel industry methods now to the tobacco industry in the 1950’s. Service personnel during World War II were given cigarettes as part of their rations, building lifelong habits. Advertisements showed celebrities like Marilyn Monroe smoking, and even a doctor. Hosts smoked on TV. About half of the population were cigarette customers then. Electric vehicles are part of California’s plan to reduce CO2, and the state adopted the Zero Emission Vehicle Action Program in 2013. In January, Governor Brown signed Executive Order B-48-18, which sets goals of building 200 hydrogen fueling stations and 250,000 electric vehicle charging stations for 1.5 million EVs by 2025. The goal is 5 million EVs a year by 2030, which means that 40 percent of new vehicles would have to be EVs by then. Per the ZEV Action Program’s website, in 2017, 5 percent of vehicles sold in California were EVs. There are now about 474,000 EVs in California, so there’s a long way to go to meet the goals, but sales are increasing, and Hochschild thinks it will accelerate. “100 percent clean energy is solvable—but it’s not a silver bullet—it’s silver buckshot,” Hochschild said. “It is a combined effort of developing clean energy sources, increasing battery storage, lowering demand, and creating a regional grid,” he added. He also said that it’s likely that the first 80 percent of the way will be easier, while the last 20 percent could be more challenging. So, although things look dire, California is leading the way, and will be doing a lot more in the future. Acterra is a San Francisco Bay Area 501(c)(3) nonprofit based in Palo Alto that brings people together to create local solutions for a healthy planet. Carl Pope, longtime environmentalist and former executive director and chairman of the Sierra Club, came to Palo Alto on November 2nd to talk to Acterra about his new book, Climate of Hope. The 264-page volume, co-written with financier and former New York Mayor Michael Bloomberg, presents climate change in a different way from what you often hear in the media, which tend to dwell on the most dramatic results of change, such as hurricanes and floods. It was a fascinating and instructive hour, and I got to meet Carl and speak with him both before and after the presentation. The book is an energizing read, as it deals with real problems but also presents lots of ways that action is already happening. My copy is now autographed. Read my detailed report on Carl’s talk on Clean Fleet Report. When you read about climate change in the news these days, it’s mostly about supercharged, destructive hurricanes, melting icecaps, and imminent catastrophe. Steve Westly, venture capitalist and former California State Controller, has a brighter vision. He shared it with a receptive group at an event hosted by Acterra at the Foster Foundation Gallery in Palo Alto. Westly, a lean, animated man who reads younger than his 61 years, knows his stuff and his audience. He presented images and data to show a world in which energy production is moving towards renewable solar and wind at a much faster pace than predicted. The transportation sector is on the verge of a massive, positive change to electric and autonomous vehicles. Much as Jeremy Rifkin proposes in The Third Industrial Revolution, Westly is placing his trust in the younger generation of millennials to pull off the work we need to combat the climate crisis. Westly grew up in Santa Clara Valley, before it was called Silicon Valley, when it was mostly farmland, Stanford University, and not much else. He witnessed the sweeping changes that transformed the valley into the place where much of the technology that can save us is now based. Westly has been involved for years. He was a board member with Tesla when it was a few dozen people in a small warehouse and has seen much more since. He knows his numbers. Carbon dioxide, CO2, is invisible, so it’s harder for people to get upset about it increasing, but air pollution is easy to understand. While the skies have largely cleared over the last 30 years or so, they are beginning to darken again, thanks to significant pollution wafting over from China – as much as 25 percent of what we breathe in California originates there. That’s because to support their economic growth, in recent years China was on a massive coal plant building spree. Now, however, that is changing to renewable energy, as the Chinese people demand an end to the choking clouds of pollution that could kill up to 83 million Chinese citizens over the next 25 years. Now, the Chinese are becoming the green energy world leaders. Per Westly, coal and nuclear are out, while solar and wind are on the way up—much more quickly than they were projected to rise. Coal is too dirty and nuclear plants are too expensive. Meanwhile, the price of wind and solar continues to drop steadily—it’s at a fraction of where it was—while natural gas, currently a popular energy source, fluctuates. Storage of solar and wind generated electricity has been a problem over the years, since the sun doesn’t shine at night and the wind doesn’t always blow, but the storage price is dropping quickly. Westly presented a chart showing a steeply descending line, depicting a 35 percent drop between 2016 and 2017 alone. This drop is in part thanks to Tesla’s huge battery gigafactory in Nevada, which when complete will be the largest building in the world. Interestingly, this American plant has pushed the Korean LG and Japanese Panasonic/Sanyo battery makers to become more competitive, all to the consumers’ benefit. Westly predicts affordable $25,000 electric cars in the next five years as part of a boom in these clean-running models. BMW, VW, and other companies are investing big time. It’s no longer going to be a small, fringe group, as EVs take over. Westly says three things are going to make leaps of progress happen: The Internet of Things, where everything is connected; Big Data, with the ability to provide the enormous amount of data needed to make connected cars work; and a sharing economy. Together, these factors will contribute to the rise of the autonomous car in just a few years. It’ll be sooner than you think, Westly promises. Westly is counting on millennials, with their different set of values, to lead the charge. They are now the largest population group, passing the aging baby boomers. Shared values of this generation include having a small carbon footprint, wanting a choice of connections, and having clean air, food, and water. Other countries are already moving ahead with plans to dump the gasoline-powered car in the next few decades. Norway say it’s 2025. India, with its huge population, says 2030 will be it. Even England and France are talking about 2040 to sell the last petrol-powered car. The U.S. today is lagging, but, as usual, California is leading the way on its own. Westly is sanguine on the possibilities of rapid, beneficial change to help combat global warming—with answers coming from Silicon Valley. The private sector, not the U.S. government, will lead the charge. It’s a very appealing vision. Acterra’s mission is to bring people together to create local solutions for a healthy planet. They put on worthwhile events and other activities in their efforts to get people involved in making a difference.